I am passionate about. I understand the importance of respectfully debating issues, making difficult decisions that benefit the residents. 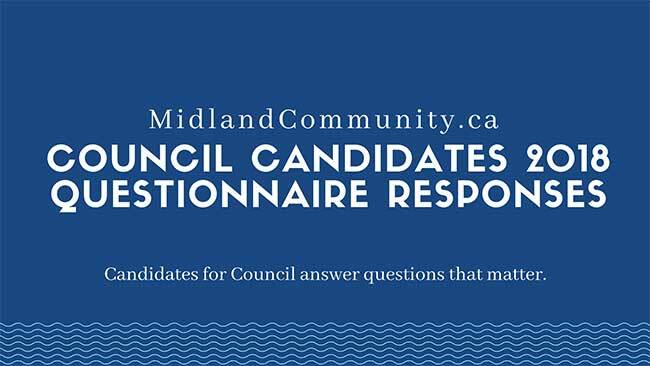 I thoroughly enjoyed the “Ambassador for Midland” role in the past and would like to continue serving as Councillor Ward One. Moving forward, Midland Council will have to make decisions on new technology, upgrades to our parks, roads, sidewalks, water and sewage plant while harmonizing the “big dig” project on King Street. Midland will need to work with County Council on affordable housing. A Community Safety Plan necessitates further development and consulting. I firmly believe in supporting local businesses and service clubs and know their beneficial contribution to our community. (a) I recognize that health and social issues should not be ignored and will work with our numerous successful agencies on these challenges by supporting the implementation of the 10-Year Affordable Housing and Homelessness Prevention Strategy along with the County of Simcoe, the Ministry of Municipal Affairs & Housing and the general public. (c) a new Operation Centre where Public Works, Parks & Recreation – all under one roof. Be the first to comment on "2018 Council Candidate Questionnaire Response – George MacDonald"